This is the 55th in a series of articles analyzing major companies traded on the tech-heavy Kosdaq market. -- Ed. While leading sectors of South Korea’s second-tier stock market Kosdaq have suffered downward pressure over the past few weeks, some powerhouses have pulled through. The share price of Koh Young Technology closed at 98,300 won ($92.1) as of Friday, up 1.7 percent from the previous trading day and up 2 percent over the past 20 trading days. The price reached an all-time high at 105,500 won in mid-April, nearly double compared to a year prior. Some 53.5 percent of its shares were owned by foreign investors as of Friday. The foreigner ownership rose by 0.4 percentage point in the past 20 trading days. This came in contrast to the Kosdaq index that fell 2.2 percent over the cited period, in part due to offshore net sales of shares worth 1.7 trillion won. Koh Young Technology’s market cap stood at some 1.35 trillion won, the 23rd-largest of some 1,200 firms listed on the tech-heavy Kosdaq, as of Friday. Koh Young Technology has produced autonomous machines used to enhance precision in mass production of contemporary electronic devices -- designed for medical purposes, machining and semiconductor production. The machines are aimed at ensuring the quality of the devices and minimizing costs to fix problems in mass producing through the inspection. It began to manufacture machines for three-dimensional solder paste inspection and 3-D automated optical inspection, both for the first time in the world. The two pieces of equipment accounted for some 90 percent of revenue, according to the firm. The company has applied for over 600 patents at home and abroad, with some 400 of them licensed, as of 2017. The number of its corporate-level customers at home and abroad stands at over 2,100. “The biggest advantage of 3-D measurement technology is its ability to measure data with high reproducibility and precision,” wrote Kim Choong-hyun, chief financial analyst at Mirae Asset Daewoo in a note to investors. The core technologies have nurtured solutions and platforms, such as auto programming, smart factory solutions, and integration with printed circuit board manufacturing equipment, based on them to support mainstay business that “competitors are unable to mimic,” Kim added. 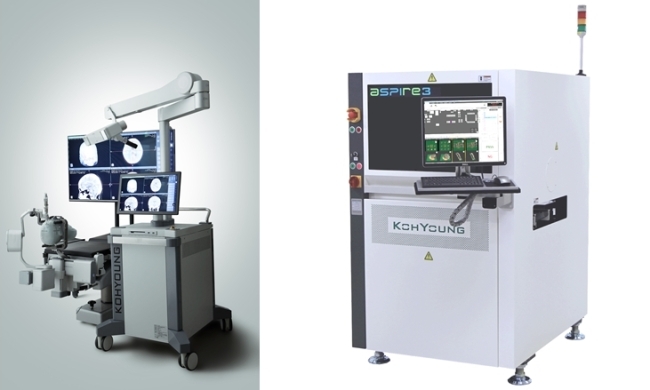 Based on untapped global market dominance of two products -- since 2006 for SPI and since 2012 for AOI, Koh Young has looked to new business areas, such as machine optical inspection, surgical robots, semiconductor inspection equipment and pin inspection equipment. The main weakness of the export-oriented company -- whose 92.8 percent of revenue came from exports -- is exposure to foreign currency exchange risk. If the Korean won strengthens against the dollar by 10 percent, it means 9 billion won loss in income and loss before income taxes as of 2017. 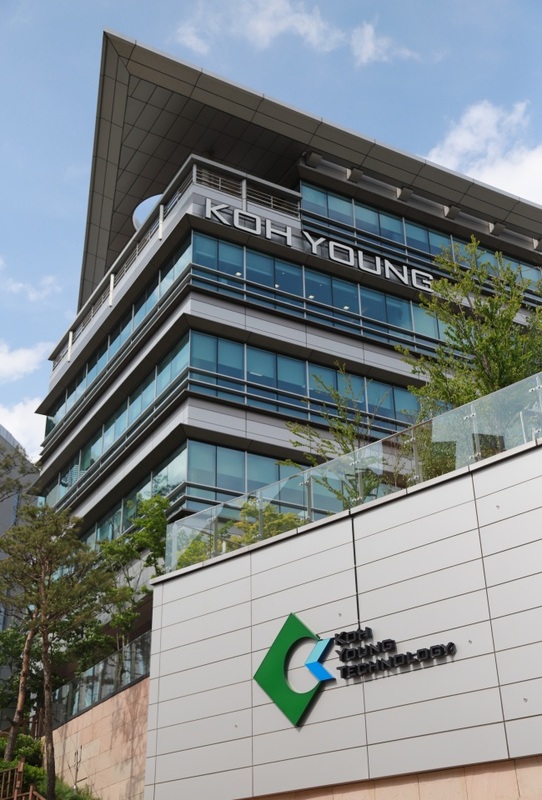 Despite currency headwinds due to the continuing trend of strong local currency, Koh Young Technology in the first quarter this year reported revenue of 49 billion won, up 13.2 percent on-year, and operating profit of 9.3 billion won, up 16.4 percent on-year. Since it was founded in 2002 and listed on the Kosdaq in 2008, the company has maintained its technological edge with a focus on research and development. Nearly half of all global employees -- 521 as of March 2018 -- are researchers working in R&D centers around the world, including the US and Korea Advanced Institute of Science and Technology in the outskirts of Seoul. The firm is also the first South Korean company to be tracked by Robo Global’s Robotics and Automation Index ETF, which owns 3.7 percent of shares as of end-2017. Koh Young Technology‘s largest shareholder is Koh Young Holdings with some 15 percent. Koh Young founder and chief executive officer Koh Kwang-ill owns 98.43 percent of the holding company.